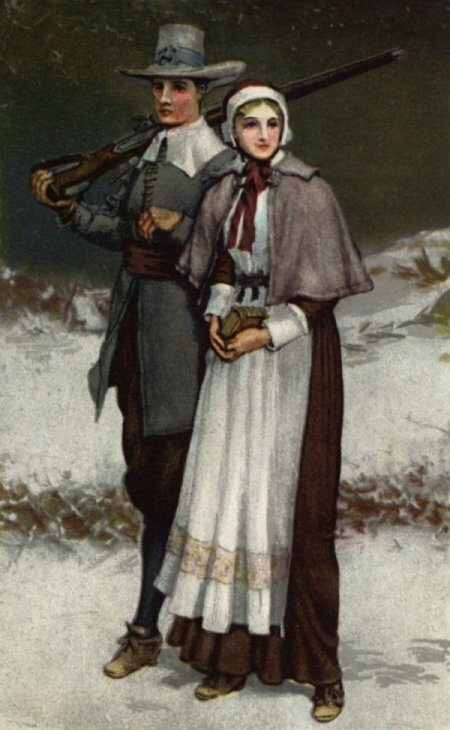 Immortalized by Henry Wadsworth Longfellow's 1858 poem, The Courtship of Miles Standish, John Alden's marriage to Priscilla Mullins was one the earliest romances in the American colonies. While the story is not verifiable, many experts do believe it in fact happened. 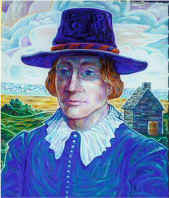 Alden and Mullins arrived on the Mayflower in 1630. Shortly thereafter, Standish, "a blunt old captain, a man not of words but of actions," according to Longfellow, took a liking to Mullins, "the loveliest maiden of Plymouth." Having the dew of his youth, and the beauty thereof. . ."
After Alden had pleaded Standish's case, Mullins said, "Why don't you speak for yourself, John?" It was clear that Alden and Mullins were in love, but the couple was afraid of offending Standish. When they received word that the captain had been killed fighting Indians, Alden and Mullins agreed to marry. At the end of the wedding, Standish, who had not been killed after all, appeared, and seeing what had transpired, gave the newlyweds his blessing and asked their forgiveness for his previous behavior. 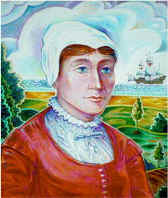 Alden and Mullins had 11 children and were among the founders of the town of Duxbury, Massachusetts.